I don’t care what moves it, I cannot really bother whether it has lots of cubbyholes to put things in, I just know that this car really moves. I mean, really. Did I mention it seats seven? Looking back on 2013 we will probably see it as a turning point in automotive history. From this moment on electric cars shouldn't be looked upon as a suspicious replacement for the automobile with lots of noise borrowed from trams. Instead, it has become an interesting – I'll go further –, even exciting means of transport. Today, when your typical luxury car cossets you with a magic carpet ride, propels your body along at supersonic speeds that you barely notice since there is no intrusion of noise, when the only time you hear the engine is when you accelerate real hard or step out of the car in a quiet street and hold your head near to the engine, well, today a petrol or even diesel powered car is not far from one of the better electric vehicles –in tactile terms that is. Each year in Tannisby, Denmark there is a huge gathering for Car of the Year journos to test freshly introduced new cars. This year there were not just one but three different electric cars lined up at the Tannishus hotel to sample. Each one of them was a revelation. See, they weren't boring at all. The Renault Zoe was good with its quality toy-like interior, huge chairs, good roadholding and agility. Even better was the BMW i3. Should there be a remake of the remake of the movie Tron sometime, there would not be any need for computer tricks anymore, this car could be bodily dropped in the shooting, it's so futuristic. And it can really pick up its skirt and fly when needed, believe me, there are some surprises to be had from it. If electric cars will be like this, I'll become a convert soon, but of course only if I am allowed to keep a classic for the weekend. In the end someone will have to use up all that remaining oil, don't you think? What really knocked me off my feet though, was the Tesla Model S. If I think about it, there are two real reasons why it would have proved impossible to conduct a consumption test with the two cars brought to Tannisby: 1) they usually lasted the whole day on one charge; 2) the queue waiting for them was so long that you really had to be as quick as an eel to grab the keys to them. Everybody, journalists and technicians, PR-people and product managers from other brands alike wanted to have a stint in one of these BMW 5-series sized electric missiles. There's absolutely no exaggeration in me saying that these cars were the true shining stars of the Car of the Year monstre testing. 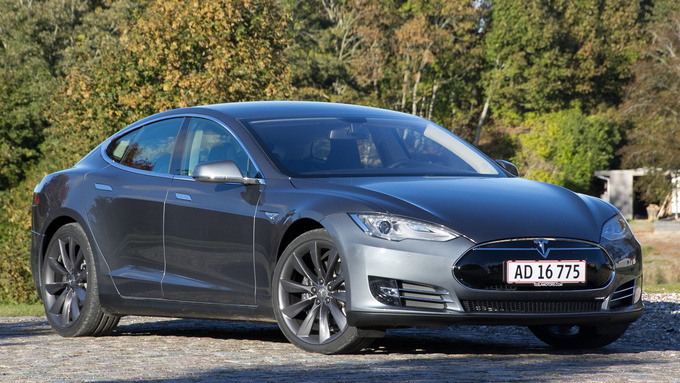 We could finally grab one of the Teslas for half an hour. In those thirty minutes we had to get ready with the exterior, interior and moving shots and we also had to test the driveability, the space, the functions et al of the car. In the case of the other cars that we tried out at Tannis we usually managed to keep the schedules. But not with this one...! It was only fifty minutes later that we managed to take it back (again, I'd like to make and apology to the others who came after us on the waiting list) still shrieking with excitement. This car really blows your mind with its effortless, neck-braking drama. It has a proper range, too. 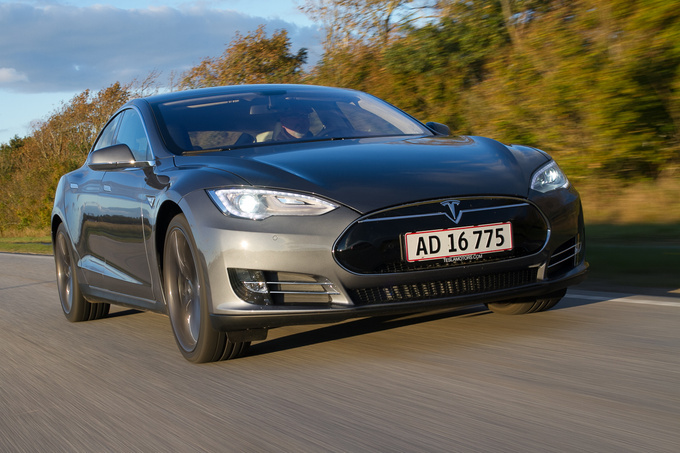 In theory a Tesla Model S can do more than 400 kilometres on a single charge if you're easy on the accelerator. In real life this is an impossible task, because there will not be a single wretched soul out there whom the Tesla doesn't turn into an animal. And when you press it, the charge level drops visibly after each sprint. Mind you, the cars somehow still managed to last the day and from the consumption graph showing on the instrument panel I could see that all my fellow colleagues checked how the Tesla's mountain-moving tide of torque plays the game of “speck of dust in the hurricane” with them. See, 422 electric horses have a quite bad sense of humour. When you hit the loud pedal in this car (which strictly speaking isn't loud at all), you get a serious trouble with your breathing, not to mention your eyeballs which suddenly want to exit your head through your ears. There aren't many cars in which the accelerator acts like a true switch working exactly like the one in your living room for the lights. Now we're standing still, flick, wow, we're doing a hundred. Like that. No delay, no build-up of torque, no monstrous rumbles, nothing, just time-warp. One moment you're at the red lights, in the next the world has disappeared behind you. 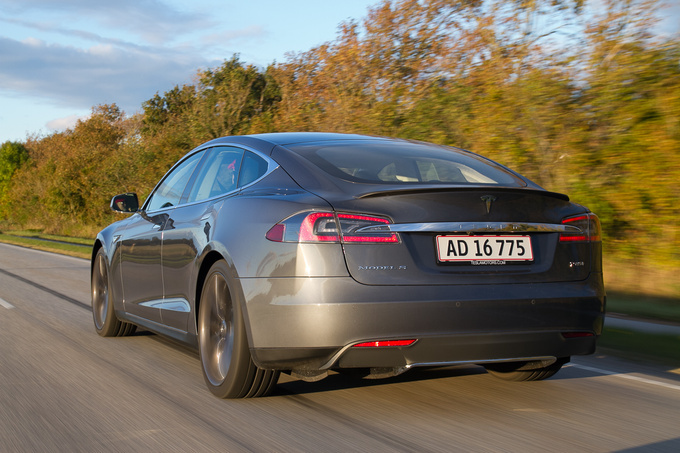 Let's put things straight: the quoted 422 PS data is calculated from the specified 310 kilowatts, but according to US measurements this car (having the strongest spec in the Model S range), has got only 416hp. What you really need to know is that you have 600 Nm's of torque on tap from the three-phase motor driving the rear wheels. It is there when you want... from 0-5300 rpm. Now that is something you can talk about in the pub. A brand new thing: an electric car for the show-off. 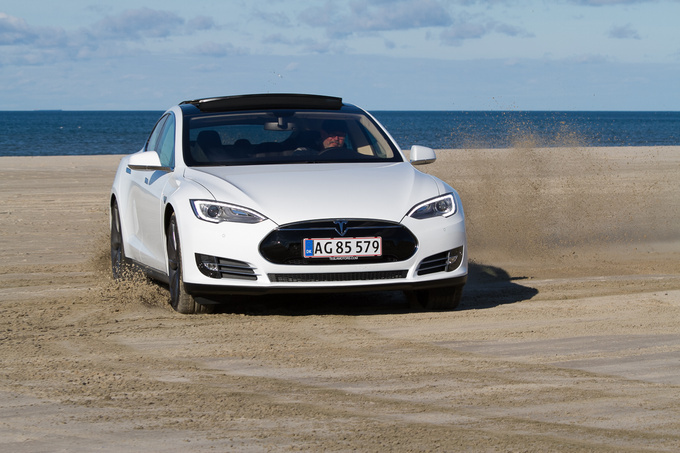 Road & Track magazine managed to measure a 4.1s 0-96kph (0-60mph) acceleration which is a tad less than the 4.4s Tesla specifies to 100kph. Acceleration like this could really give problems to companies keeping the road network in good condition. 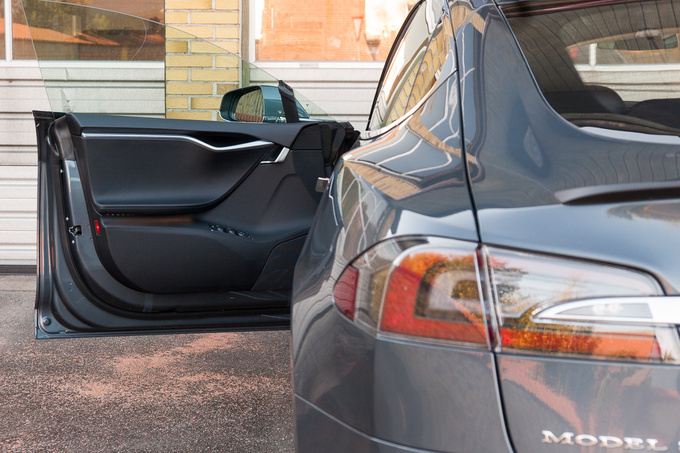 This Model S Performance Package P85 that we tried is the Kama-Sutra of all electric cars existing today. It is tremendously quick and silent, and according to performance figures it is on par with the Ferraris of a generation earlier – that is apart from its top speed, which is only 220kph. Electric cars had been good at moving for a long time – think of Camille Jenatzy's “Jamais Contente” that was the first car to top the ton in 1899 – but the obligatory energy regeneration in these cars almost always ruins the brakes, ending in a nonlinear pedal movement or a wooden feel. 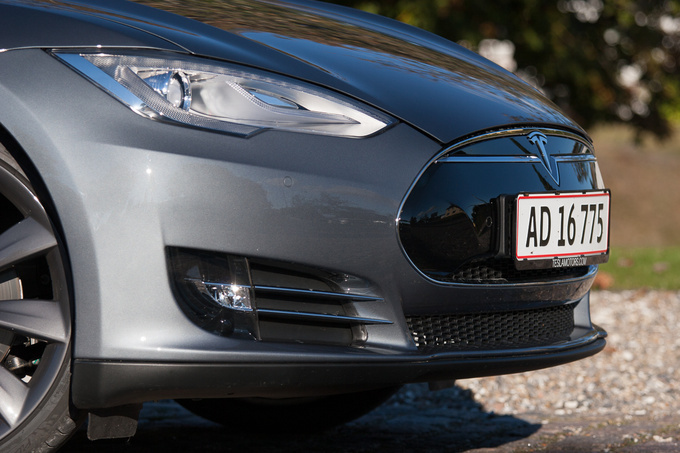 The Tesla is no exception, but it only suffers a little from these limitations. In normal use the middle pedal operates just like any other car's, but at emergency brakes there is a brutal, unexpected change of deceleration – probably the brake assist system is a bit over-zealous. It is these instances when you can also hear some tram noise but it's not worse than what comes out of a super-modern monorail. 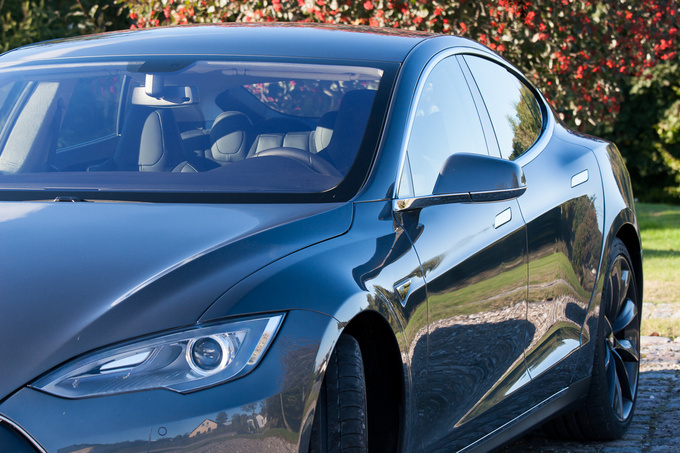 As a car the Model S really shines. Although the steering is servoed with an electric motor, it is direct, easy-operating, if not being as full of feel as say, a BMW's. Denmark is a country with really slow traffic where most of the drivers seem to be half asleep behind the wheel. These kinds of roads are not the best proposition if you're testing a big car with a weight of a stately mansion with the acceleration of a rocket. There aren't too many curvy mountain venues around either but it is at least possible to find some wide intersections where one can get a taste of turning the steering wheel. In these the Tesla cornered flat – it was no surprise since it's a car with all of its batteries in the base plate of its chassis. It doesn't really want to put its tail out either since the tyres up front are 245/35 ZR21's and 265/35 ZR21's at the rear. The car might be a tad blunter than its nearest rival, the BMW 5-series, but not by much. Its comfort isn't something you'd criticise either. As I mentioned you can hear almost no noises in it except the wheels a bit when rolling along grainy tarmac. 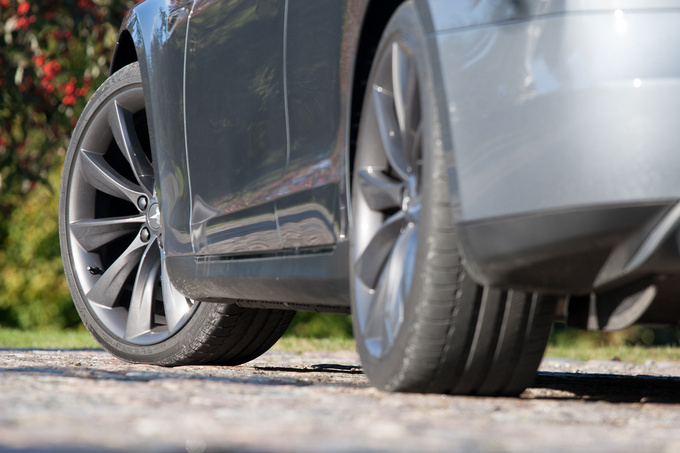 The suspension is pretty much on the spot too, since the car rides on air springs, though the Performance Plus we drove has a sharper setup than the other versions and you tend to notice this when you hit larger patches on the asphalt. And it beats all of its contenders in terms of practicality. 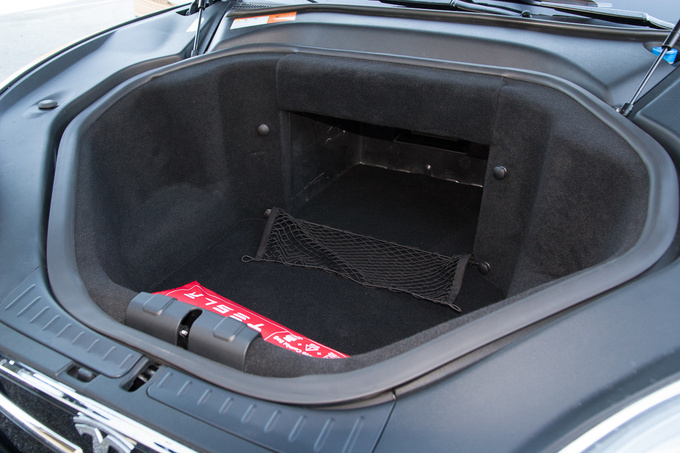 One of the surprises is that it has not one but two places to put luggage in – a boot in the rear with 690 litres (1645 when you fold the seats) and one where the engine would be with 150 litres. That makes 1795 litres altogether – and that could make even the white van man to take a long look. Another nice trick is that you can unfold two seats from the boot. The problem is that size-wise these are strictly for kids and they also face rearwards, but at least they have five-point harnesses. Knowing the car's acceleration we might call this a well-devised safety precaution. If you're good at counting you'll arrive to the sum of 5+2 that is 7 seats altogether. The style of the interior will divide the opinions though. Some will think it's desolate and bare, since there are no controls whatsoever beside the column stalks, the two pedals, the steering wheels, the warning flashers and the pushbutton for opening the glove compartment. Uh, and there is a horn push also. But there will be many others – mainly gadget freaks - who will see the Model S's interior as a very stylish exercise pointing the way forward. 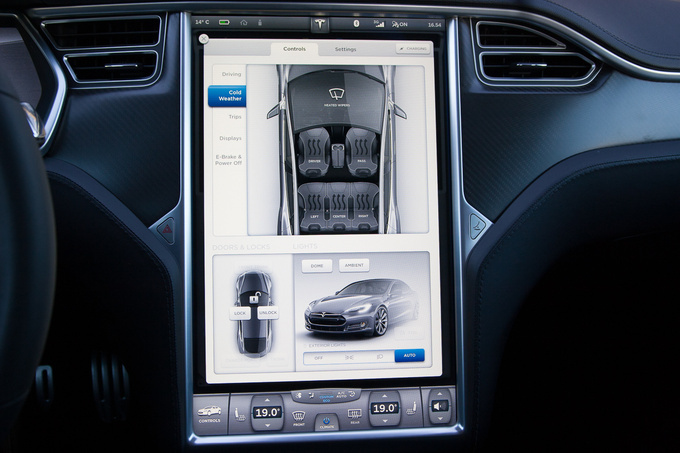 All you see from the driver's seat is a passive and an active liquid crystal display. The smaller one of these is situated in front of the steering wheel and this one shows the speed, the amount of energy used, the range, and the graph telling the history of energy usage is also situated here. 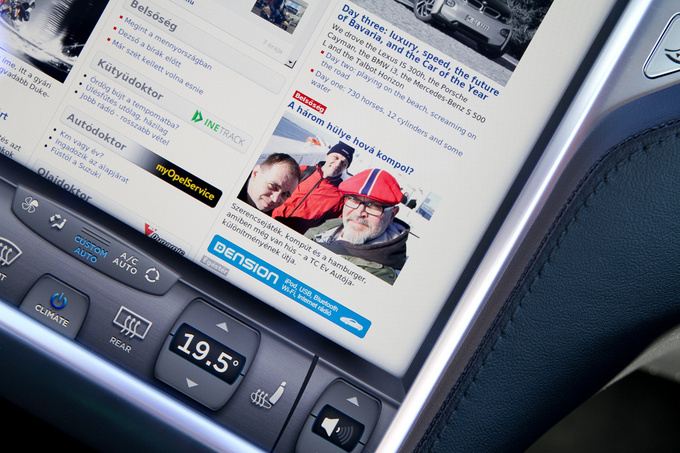 Then there is the other, 43cm touch-screen; you control all the functions of the car from this one. Since it is huge you better divide it into smaller windows so you can simultaneously see multiple functions. And when the car is turned on – let's say it is running – and both panels are in operation, the interior doesn't look bare at all. In fact it is quite entertaining. The first meeting with a car like this is very similar to your first encounter with a new smart phone. But this is a smart phone that has been well thought out, tested and filed for a long time. It soon becomes second nature to use it, although it is disturbing that some basic functions have to be turned on from the touchpad. 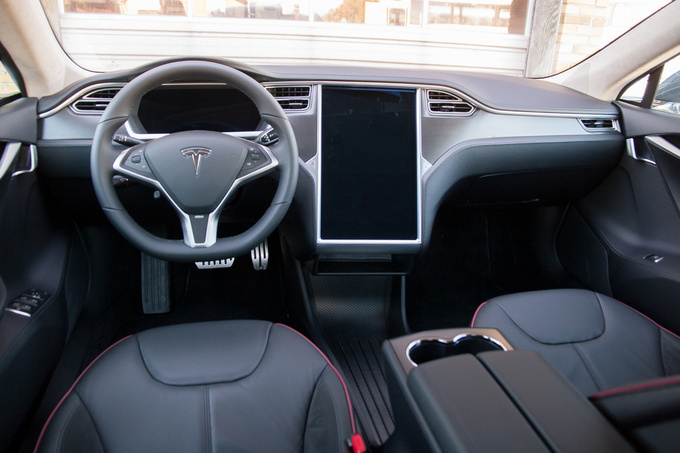 I have to admit there was that long minute of silence with my colleague when we were trying to locate the switch for turning on the lamps, but for people with a bit more experience with gadgets, all that the Tesla offers will be a doddle. What really is disturbing is the absence of cubbyholes. There are no pockets on the doors (as we learned, this is an intentional part of the design) and though the car is missing the central tunnel for the prop shaft, so in theory there is a huge place in the middle, this part between the two front seats is unusable, since there is only a large, flat tray there with low edges. Anything you stow here will either slide about or fly out. Those guys at Tesla aren't completely out of their minds though, because for some extra money you can order various stowage boxes. The space on offer is very good up front, with large, well-formed chairs, ample room for the heads, legs and shoulders on both sides - no complaints here. But the rear seating is a part of the car that the designers really forgot to think about. One would think that they used a set of dummies from a wrong scale. The space is just about acceptable up to 180cms; anybody taller than this will find the place suffocating. Your legs don't really fit behind a tall-ish driver, and due to the slope of the roof you cannot sit upright. Well, you're obliged to bend your head before the altar of this new age of motoring... To put it straight: an offer like this is considered bad even amongst cars one size smaller than this. Since we're talking about a brand which is so new the paint hasn't dried on the factory gates yet, the quality of workmanship could be a serious issue here. Never worry, it's good enough by any standard. My colleague Zoltán commented that there is a whiff of small-scale car manufacturing in the interior: after he'd said it, I noticed it too, but none of us could point at the exact source, maybe it's the shapes, maybe the weird controls. But what you see is real and expensive. 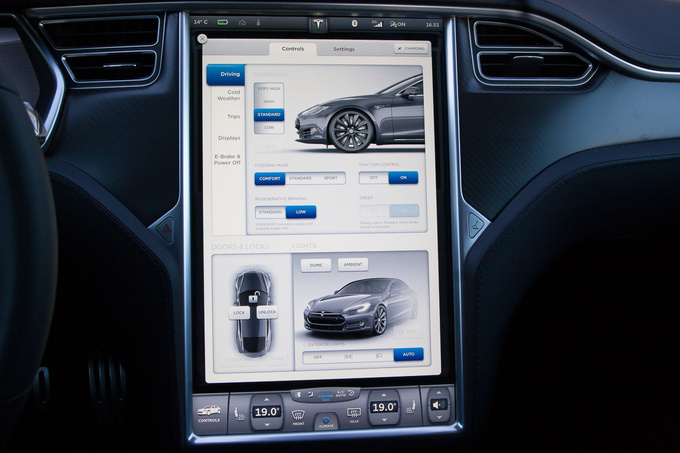 Leather is real leather, metal is cold metal, the glass on the displays... oh, well, that's plastic, the Tesla isn't a 100% iPhone yet. Simple, clean lines, perfect fit, a deep thump from the doors when they close - the car is built like a brick, certainly on par with its price level. The base price of our test car was 69,000 Euros and by the time all the packages and extras were grafted on it – funny, but you have to pay extra for the parcel shelf, the GPS, the motorized seats and the parking aid - the number changed to 93,600. To have a big, air-sprung, seven-seater, low consumption car with no emissions that, on a good day, can bloody a Porsche's nose doesn't sound too bad for such kind of money. 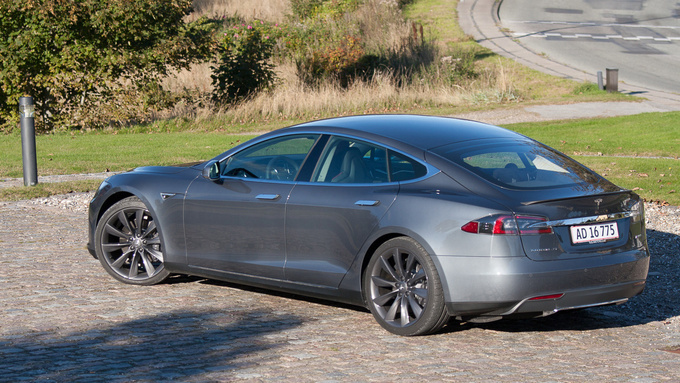 But you should never say that you bought a Tesla Model S Performance Package P85 because it's frugal. The whole world will laugh at you. Buy it out of love, don't drive on anything that is lying around on the motorway and you'll never want to part with it. 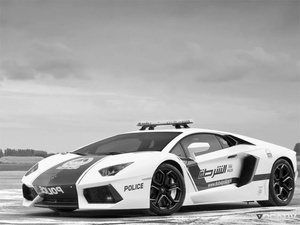 A hangar loaded with supercars fitted with bluelights and sirens. The whole fleet in one video.